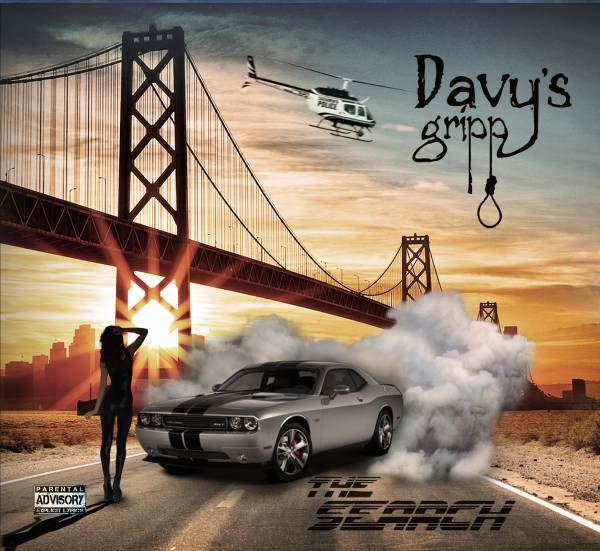 South Coast based band Davy’s Gripp are about to release their second EP comprising of 5 tracks and entitled ‘The Search’ along with a premiere of their music video which is being launched on YouTube on 26th October at 8pm (UK time), to much anticipation. Having been very kindly given a preview of the new EP and video prior to general release by the band, I can honestly say that not only will current fans of the band be thrilled by their latest release but this is the EP that is going to gain a whole new legion of fans with their music. ‘The Search’ opens to opens to gritty guitars from both Chris Kanter and Justin Woods, with thunderous drums from Matt Taylor and a sleek bass line from Benji Burns before the lush and powerful vocals of Richie Martin explode into a wall of sound. Sounding memorable from the outset, the song has it all, huge guitars riffs with the whole of the band sounding incredibly tight throughout the song and you can’t help but be impressed at the very first listen at just how awesome this track sounds, it is a monster of a rock song. The video for ‘The Search’ is action packed from start to finish. Sequences of the band in front of monster amps, a gorgeous woman in the lead role, the coolest motorbike ever seen, hot looking pole-dancers and a captivating back story accompanying panoramic and close-up scenes of the band performing the song, all interspersed with a retro feel in the action segments, this is no standard rock video. The band generate an epic performance throughout, looking every inch a rock band and it is completely mesmerising from the very first second, this is definitely an exciting video that is going to get a serious amount of views on its release. ‘State Of Mind’ has soaring rock guitars riffs that lead to a fast paced full on rock song, the raw and powerful vocals making this track how rock should be and is a song that has to be played at full volume to appreciate how great it sounds. Moving on the delicate and slightly haunting ‘Me, Myself and I’ with a soulful guitar solo starting from the outset, the gentle and emotional vocals perfectly suit the tone of the song. This is an epic rock ballad that is beyond melodic and rises to a dynamic sound. With pounding drums from the very first note, ‘Over Rated’ is a rock anthem of a song. Enormous guitar riffs with commanding vocals, it is one of those fist-pumping songs every band should have. Finishing the EP with ‘Pressure’ which has one of the fastest guitars riffs ever heard on a rock song as they really stand out in this track, is a crescendo of guitars, bass, drums and vocals all combining to being a massive sounding rock track. This latest EP from Davy’s Gripp has shown that this band have taken things to another level of excellence with their forthcoming release and having already produced some of the highest quality rock music heard in a long time, ‘The Search’ is going to be one of those records that is going to be impossible to stop playing for a long time to come.